Some of my favorite restaurants in NYC aren't necessarily foodie, Michelin-starred destinations...they're often tiny little mom-and-pop-owned places serving honest, good, satisfying food that doesn't cost a fortune. Which, incidentally, describes most Chinatown restaurants to a tee. Seriously, sometimes there's just nothing better than sitting at a small Formica table and shamelessly digging into heaping servings of crisp salt-baked shrimp, crunchy pan-fried noodles and finishing off the feast clutching a steaming cup of cleansing hot tea. Cook noodles according to package directions, then drain in a colander. Stir together oyster sauce, soy sauce, sugar, cornstarch, and water until smooth. Heat 1 tablespoon oil in a 10-inch nonstick skillet over medium-high heat until hot. Add noodles to skillet, pressing them with a rubber spatula to form a cake, and cook until underside is golden and crisp, about 4 to 6 minutes. Flip cake over and drizzle 1 tablespoon oil around sides of cake, then cook until underside is golden, another 4 to 6 minutes. Transfer noodle cake to a cutting board and cut into quarters. Heat 1/2 tablespoon oil in a wok or 12-inch heavy skillet over medium-high heat until it begins to smoke. Stir-fry snow peas with a pinch of salt until bright green, 1 to 2 minutes, then transfer to a plate. Add 2 tablespoons oil to wok and stir-fry scallions and ginger with 1/4 teaspoon salt 30 seconds. Add half of beef and cook, undisturbed, 45 seconds, then stir-fry until beef is just browned, 1 to 2 minutes more. Transfer to plate with snow peas. Add remaining tablespoon oil and cook remaining beef in same manner. Stir sauce mixture again, then add to skillet and bring to a boil. 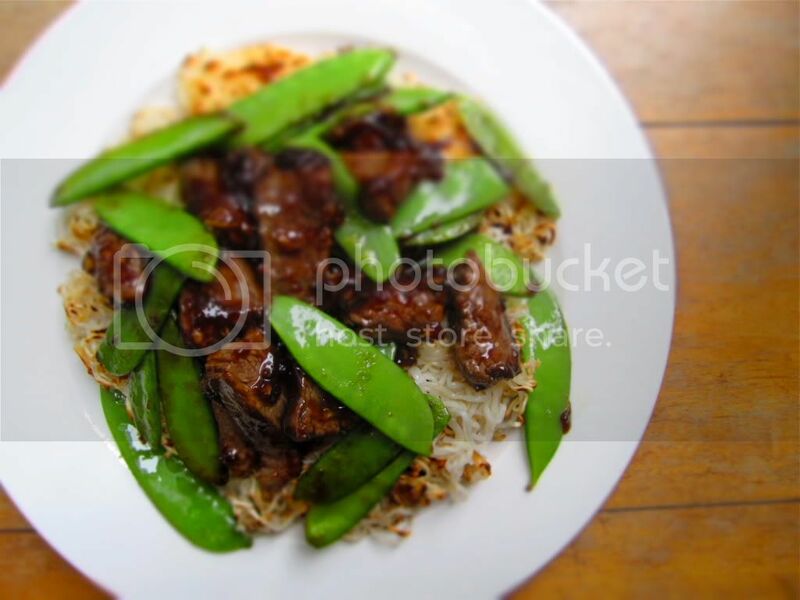 Stir in beef and snow peas, then serve spooned on top of noodle cake.